The preparation of both pastes is basically the same and pretty easy. 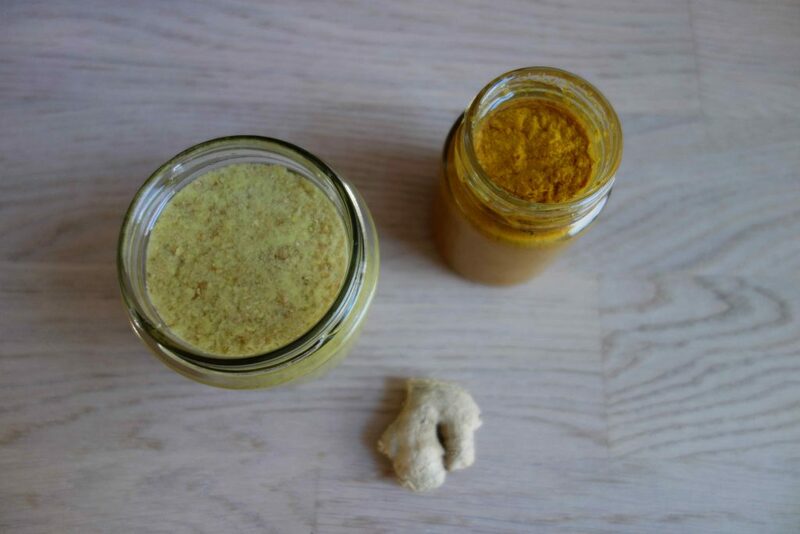 First you chop the ginger or turmeric and add it to your blender as well as the salt and neutral oil. When working with turmeric, I would definitely recommend wearing gloves, because turmeric stains like crazy. Now blend everything together until a thick paste forms. Then sterilize two screw top jars with boiling water and fill them with the pastes. Try not to touch the rim of the jars to keep them as clean as possible. If you messed it up, clean the rim with a fresh kitchen towel. Now cover the pastes with neutral oil and store them in the fridge. When you need some paste, take a clean teaspoon, get some of the paste on it and cover the rest with some oil again.